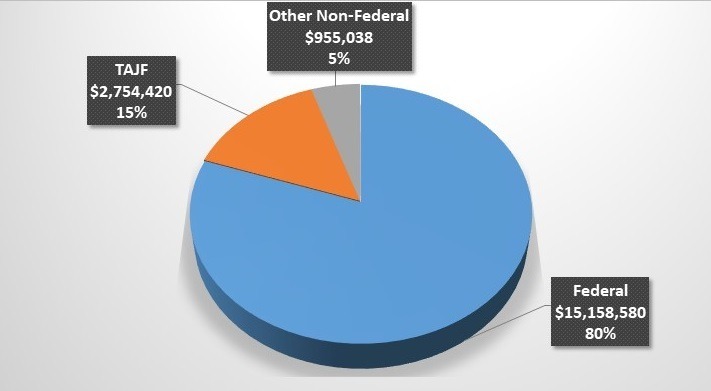 The following list of federal formula grants and the statutory authority for each grant makes up a significant portion of funding for Disability Rights Texas. In addition, Disability Rights Texas receives non-federal funding, including grants and donations from the Texas Access to Justice Foundation, private entities, and individuals. Disability Rights Texas submits an annual IRS 990 form and undergoes a Single Audit as required by most of our funding sources. The BCLS program was established by the Texas Access to Justice Foundation and awarded to Disability Rights Texas to provide legal advocacy to low income individuals with disabilities in Texas. See 42 U.S.C. § 15041-15045. See 45 C.F.R. § 1386.19-1386.25. PADD is the first P&A program, created by the Developmental Disabilities Assistance and Bill of Rights (DD) Act of 1975. P&A agencies are required by the Act to pursue legal, administrative and other appropriate remedies to protect and advocates for the rights of individuals with developmental disabilities under all applicable federal and state laws. The DD Act provided for the governor of each state to designate an agency to be the P&A and to assure that the P&A was, and would remain, independent of any service provider. Most entities designated as P&As are private non-profit organizations created specifically for the purpose of conducting the P&A programs. However, some P&As are part of state government, a few are hybrid quasi-public agencies, and a few P&As reside within civil legal services programs. Subsequent P&A statutes, with a single exception Client Assistance Program (CAP), provide for the new P&A programs to be housed within the same agency designated by the governors under PADD. See 42 U.S.C. § 10801-10851. See 42 C.F.R. § 51.1-51.46. See 42 U.S.C. § 300d-53. The PATBI program was created in 2002 to provide protection and advocacy services to individuals with traumatic brain injury. Although P&As often served such individuals under PAIR, CAP, or PABSS, this grant provides more resources specifically to address the unique needs of this population. See 29 U.S.C. § 794e. See 34 C.F.R. § 381.1-381.33. Congress established the PAIR program under an amendment to the Rehabilitation Act in 1993. PAIR programs provide for services to persons with disabilities who are not eligible for services under the three previously established P&A programs (PADD, PAIMI, and CAP). With PAIR, the P&As were thus authorized to serve persons with all types of disabilities. Although PAIR is funded at a lower level than PADD and PAIMI, it represents an important component of a comprehensive system to advocate for the rights of all persons with disabilities. See 29 U.S.C. § 3001-3007. The PAAT program was created in 1994 when Congress expanded the Technology-Related Assistance for Individuals with Disabilities Act (Tech Act) to include funding for P&As to assist individuals with disabilities in the acquisition, utilization, or maintenance of assistive technology devices or assistive technology services through case management, legal representation and self advocacy training. See 52 U.S.C. § 21061-21062. The PAVA program was established in 2003 as part of the Help America Vote Act of 2002 (HAVA). Under this program, P&As have a mandate to help ensure that individuals with disabilities participate in the electoral process through voter education, training of poll officials, registration drives, and polling place accessibility surveys. P&A agencies may not use PAVA program funds for litigation. There is no such restriction in any of the other P&A programs. See 42 U.S.C. § 1320b-21. The PABSS program was established in 1999 when the Ticket to Work and Work Incentive Improvement Act (TWWIIA) was enacted into law. Under this Act, grants to the P&A programs provide advocacy and other services to assist beneficiaries of Social Security secure or regain gainful employment. See 42 U.S.C. § 405 (j)(6).